Aarstad, Åsne Kalland 2018. Security Privatization. p. 79. Lauer, Helen 2018. Method, Substance, and the Future of African Philosophy. p. 229. 2018. Protektionismus und Freihandel. p. 89. Ruggie, John Gerard 2018. Multinationals as global institution: Power, authority and relative autonomy. Regulation & Governance, Vol. 12, Issue. 3, p. 317. Roth-Isigkeit, David 2018. The Plurality Trilemma. p. 31. Lindahl, Hans 2018. Authority and the Globalisation of Inclusion and Exclusion. 2018. Protektionismus und Freihandel. p. 307. Pal, Maïa 2018. ‘My Capitalism Is Bigger than Yours!’. Historical Materialism, Vol. 26, Issue. 3, p. 99. Haufler, Virginia 2018. 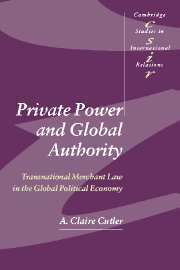 Producing Global Governance in the Global Factory: Markets, Politics, and Regulation. Global Policy, Vol. 9, Issue. 1, p. 114. Aarstad, Åsne Kalland 2017. Maritime security and transformations in global governance. Crime, Law and Social Change, Vol. 67, Issue. 3, p. 313. BRABAZON, HONOR 2017. Occupying Legality: The Subversive Use of Law in Latin American Occupation Movements. Bulletin of Latin American Research, Vol. 36, Issue. 1, p. 21. Siliquini-Cinelli, Luca 2017. The Constitutional Dimension of Contract Law. p. 289. Vilaca, Guilherme Vasconcelos 2017. Encyclopedia of the Philosophy of Law and Social Philosophy. p. 1. Möller, Kolja 2017. Perspektiven sozialer Demokratie in der Postdemokratie. p. 179. Campbell-Verduyn, Malcolm 2017. Professional Authority After the Global Financial Crisis. p. 83. Bexell, Magdalena 2016. The Rule of Law in Global Governance. p. 181. Scheuerman, William E 2016. Civil disobedience in the shadows of postnationalization and privatization. Journal of International Political Theory, Vol. 12, Issue. 3, p. 237. Galán, Alexis 2016. New wine, old wineskins: on the geographical assumptions of international constitutional law. Journal of International Relations and Development, Vol. 19, Issue. 2, p. 222. Davies, Thomas R. 2016. History of Transnational Voluntary Associations. Voluntaristics Review, Vol. 1, Issue. 4, p. 1. '… constitutes a very valuable step towards embracing a more comprehensive view of the complexity of developments in national, international and transnational law … a worthy attempt to visit and revisit the traditional approaches with which we have all been trained and professionalized … Private Power and Global Authority deserves to be highlighted in many respects … a much-needed study … a crucial report on internal affairs …'. Baer, Marvin, Joost Bloom, Elizabeth Edinger, Nicholas Rafferty, Geneviève Saumier, and Catherine Walsh 1997, Private International Law in Common Law Canada: Cases, Texts, and Materials, Toronto: Emond Montgomery Publications Ltd.
Clough, Shepard B. 1959, The Economic Development of Western Civilization, New York: McGraw-Hill Book Co. Inc.
Clough, Shepard B. and Charles W. Cole 1946, Economic History of Europe, rev. edn, Boston, MA: D. C. Heath & Co.
Kindred, Hugh M., J.-G. Castel, W. Graham, A. De Mestral, L. Reif, I. Vlasic, and S. Williams 1993, International Law: Chiefly as Interpreted and Applied in Canada, 5th edn, Toronto: Emond Montgomery Publishers Ltd.
Koskenniemi, Martti 1989, From Apology to Utopia: The Structure of International Legal Argument, Helsinki: Finnish Lawyers' Publishing CO.
Sanborn, Frederic R. 1930, Origins of the Early English Maritime and Commercial Law, London: Century Co. Select Essays in Anglo-American Legal History, 3 vols., 1907–1909, Boston: Little, Brown and Co.
Story, Joseph 1834, Commentaries on the Conflict of Laws, Foreign and Domestic in Regard to Contracts, Rights and Remedies, Especially in Regard to Marriages, Divorces, Wills, Successions and Judgments, Boston: Hill and Gray and Co.
Teubner, Gunther (ed.) 1997 a, Global Law Without a State, Aldershot, England and Brookfield, USA: Dartmouth Publishing Company Ltd.
Trakman, Leon E. 1983, The Law Merchant: The Evolution of Commercial Law, Littleton, CO: Fred B. Rothman and Co.
Ziegel, Jacob (ed.) 1995, Twenty-fifth Annual Workshop on Commercial and Consumer Law “Harmonization and Change” Workshop Papers and Other Materials, Toronto: S. N.
General Assembly Resolution 2205 (21) December 17, 1966 Official Records of the General Assembly, Twenty-first Session, Annexes, agenda item 88, UN Doc. A/6396 and Add. 1 and 2, reprinted in United Nations Commission on International Trade Law Yearbook, vol. I, 65–6. Development of Guidelines on the Role and Social Responsibilities of the Private Sector, Report of the Secretary General of the United Nations 24 February, A/AC. 253/21, February 24, 2000. Report of the Secretary-General on the Progressive Development of the Law of International Trade, UN Doc. A/6396, reprinted in United Nations Commission on International Trade Law Yearbook 1968–70, vol I, pp. 18–45. Report of the United Nations Commission on International Trade Law on the Work of its Ninth Session, UN Doc. A/Conf. 31/17, reprinted in United Nations Commission on International Trade Law Yearbook 1978, vol. IX, pp. 3–9. Report of the United Nations on the Progressive Development of the Law of International Trade, UN Doc. A/6396, reprinted in United Nations Commission on International Trade Law Yearbook 1968–70, vol. I, pp. 58–65. “Unification of the Law of International Trade: Note by the Secretariat,” Official Records of the General Assembly, Twentieth Session, Annexes, agenda item 92, UN Doc. A/C. 6/L.572, reprinted in United Nations Commission on International Trade Law Yearbook 1968–73, vol. I, p. 17. “Working Methods of the Commission: Note by the Secretariat,” UN Doc. A/Conf. 9/299, reprinted in United Nations Commission on International Trade Law Yearbook 1988, vol. XIX, pp. 165–69. Charter of the United Nations, June 26, 1945, Canada Treaty Series, 1945, No. 7, International Legislation IX, No. 327. Convention on the Execution of Foreign Arbitral Awards, September 26, 1927, League of Nations Treaty Series 92: 301. Convention on the Limitation Period in the International Sale of Goods (New York, 1974), UN Doc. A/Conf. 63/15, reprinted in International Legal Materials 13 (1974): 952–61. Free Trade Agreement (Can—US), January 2, 1988, Canada Treaty Series, 1989, 3. General Agreement on Tariffs and Trade, October 30, 1947, 61 Stat. A-11, 55 United Nations Treaty Series: 194. Guidelines for Procurement under World Bank Loans and International Development Association Credits, Washington, DC: World Bank, 1992.
International Chamber of Commerce Uniform Customs and Practice for Documentary Credits, April 29, 1994, UN Doc. A/CN.9/395. International Chamber of Commerce Uniform Rules for a Combined Transport Document, October 1975, Paris: International Chamber of Commerce, Pub. No. 298. Incoterms 1980, Paris: International Chamber of Commerce Series, SARL, 1980. Incoterms 2000, Paris: International Chamber of Commerce, 2000, Pub. No. 620. Multilaterally Agreed Equitable Principles and Rules for the Control of Restrictive Business Practices, UN Doc. A/Conf.2/35/6. North American Free Trade Agreement, December 17, 1992, US—Can—Mex; repr. 1993 International Legal Materials 32: 296. Protocol on Arbitration Clauses, 24 September 1923, League of Nations Treaty Series 27: 158. Statute of the International Court of Justice, signed 1945; reproduced in Hugh Kindred, Jean-Gabriel Castel, Donald Fleming, William Graham, Armand de Mestral, Linda Reif, Ivan Vlasic, and Sharon Williams 1993, International Law: Chiefly as Interpreted and Applied in Canada, Documentary Supplement, Toronto: Emond Montgomery Publications Ltd, pp. 33–44. United Nations Commission on International Trade Law Arbitration Rules, UN Doc. A/31/17. United Nations Commission on International Trade Law Conciliation Rules, UN Doc. A/Conf. 35/17, reprinted in International Legal Materials 20 (1) (1981): 300–6. United Nations Commission on International Trade Law Model Law on Electronic Commerce, November 11, 1996, UN Doc./A/C.6/51/L8. United Nations Commission on International Trade Law Model Law on International Commercial Arbitration, UN Doc. A/Conf. A/40/17, reprinted in United Nations Commission on International Trade Law Yearbook 1986, 16: 393. United Nations Commission on International Trade Law Model Law on Procurement of Goods, Construction and Services, December 9, 1993, UN Doc. A/RES/48/33. United Nations Conference on Trade and Development Convention on a Code of Conduct for Liner Conferences, November 30, 1984, UN Doc. TD/B/C.4/Dec/50/Ⅺ. United Nations Conference on Trade and Development International Code on the Transfer of Technology, June 3, 1970, UN Doc. TD/DEC/113 (6). International Institute for the Unification of Private Law 1994, Principles of International Commercial Contracts, Paris: International Institute for the Unification of Private Law. United Nations Convention on the Carriage of Goods by Sea, 1978 (Hamburg Rules),UN Doc. A/Conf.89/13, Annex 1, reprinted in International Legal Materials 17 (1978): 603–31. United Nations Convention on Contracts for the International Sale of Goods (Vienna Sales Convention), UN Doc. A/Conf. 97/19, 178–90, Annex I, reprinted in International Legal Materials 19 (1980): 668–99. United Nations Convention on International Bills of Exchange and International Promissory Notes, December 9, 1988, UN Doc. A/RES/43/165; repr. International Legal Materials 28 (1989): 170. United Nations Convention on the Liability of Operators of Transport Terminals in International Trade, April 19, 1991, UN Doc. A/Conf. 152/13; repr. International Legal Materials 30 (1991): 1503. United Nations Convention on the Recognition and Enforcement of Foreign Arbitral Awards (New York Convention), June 10, 1958, UN Doc. A/Conf.9/22, reprinted in International Legal Materials (1968): 1,042–62. Vienna Convention on the Law of Treaties, 1969, 155 United Nations Treaty Series: 331.